On December 14th, R. Kelly will be releasing his 11th studio album. It features the instant classic "When A Woman Loves" which is also the song that he tore up on the Soul Train awards. 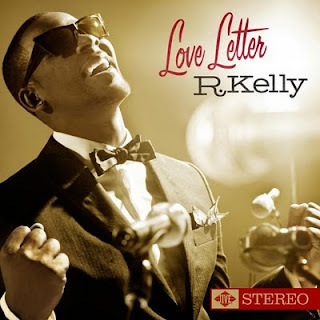 The album "Love Letter" will be paying homage to Soul legends such as: Sam Cooke, Donny Hathaway, and Marvin Gaye. Check out the album for yourself. It truly is a Love Letter in album form. It takes you back to love songs. He's currently streaming the entire album. He successfully keeps his self identity while paying homage to classic soul music. It's feels like a follow up to the Chocolate Factory album. This is an album that you can play straight through without skipping tracks. Track 4 "Not Feelin' the Love" has a very Michael Jackson feel. Reminds me of "You Are Not Alone" which R Kelly wrote and produce for Michael. His delivery is very Michael Jackson as well. Fast forward you hear Track 6 which sounds very Marvin Gaye. Track 8 has a Sam Cooke feel similar to "When A Woman Loves". Track 10 is a duet with his artist K. Michelle that reminds you of a Marvin Gaye & Tammi Terrell duet. Track 11 Music Must Be A Lady is where R Kelly really gets off sounding damn near like Marvin Gaye (think Distant Lover). The album closes with the dramatic "How Do I Tell Her" which gives you classic R. Kelly but very similar to a Righteous Brother song.